DETAILS of an alleged UFO sighting near a Suffolk RAF base more than 20 years ago have been released under the Freedom of Information Act. The Rendlesham File is one of the first documents to be released as part of an opening-up of the inner workings of Whitehall. It had previously only been seen by about 20 people, who requested access to it through the American Freedom of Information Act. The sighting of a 'strange triangular glowing object' near RAF Woodbridge in the early hours of December 27, 1980 is described in colourful detail. A number of US Air Force men witnessed the object hovering in the darkness, transmitting blue pulsating lights and sending nearby farm animals into a 'frenzy'. In a report entitled Unexplained Lights, USAF Lt Col Charles I Halt, Deputy Base Commander at RAF Bentwaters, adjacent to Woodbridge, told how he witnessed an object emitting a "red sun-like light" moving through the trees. Two USAF security police patrolmen first spotted 'unusual lights' outside the back gate of RAF Woodbridge. After gaining permission, the two men and a third patrolman investigated the lights. 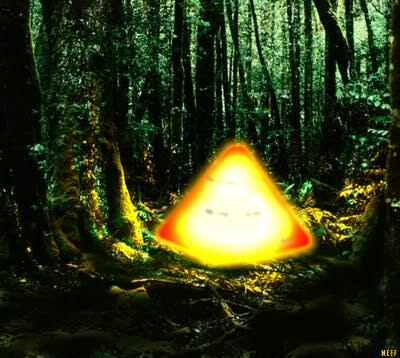 In his report, Lt Col Halt said: "The individuals reported seeing a strange glowing object in the forest. The object was described as being metallic in appearance and triangular in shape, approximately two to three metres across the base and approximately two metres high." Next morning Lt Col Halt and his men discovered three circular depressions, seven inches in diameter, in the ground. Radiation measuring 0.1 milliroentgens was recorded in the depressions - a level 10 times higher than normal. The MoD said one theory about the sightings was that it could have been the beam of the nearby Orford Ness lighthouse "with distortions being caused by the beam having been seen through the trees".